I hope to provide a slight antidote to the big "x" that gets put across printed magazines. Innovation, creativity, and thought are essential to the success of any publication and it’s these qualities that Jeremy Leslie looks for in the independent publications he curates on his blog, magCulture. The blog is a great resource that gives independent magazines a wider reach and their audience easier access. We had a chance to hear Jeremy speak at the Walker Art Center’s Opening-Day Talk: Already in Progress, part of the Graphic Design: Now in Production exhibition. He spoke on the challenges that print publishers face today: the need to find interesting angles in traditional genres, to push the medium of print with innovative formats and content, and to challenge what is available online. Jeremy said, “It’s been going around that magazines are over, magazines are dead. It’s a lazy headline and it’s like a virus that goes around. I hope to provide a slight antidote to the big ‘x’ that gets put across printed magazines.” For Jeremy, print is not dead. It’s just being reinvented. Designers just have to accept the challenge and get great content out there. The magazines shown in the exhibition, including It’s Nice That, Little White Lies, Port, and Bloomberg Business Week, represent the best design and content found in independent and major publications. 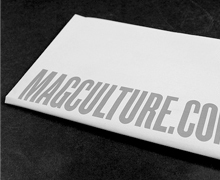 If you’re not already an avid reader of magCulture, it’s worth a look. We think you’ll like what you find.